Metallic gray ASUS VivoBook R416SA-EH21 is a 14 inch budget notebook with a light and very slim design, without the low end specs you might expect, as it seems to offer you quite a lot for your money, such as the Full HD display, 128GB eMMC flash storage, good battery life and modern connectivity ports. Technical specs include the ultra low voltage quad core Pentium N3700 processor at 1.6GHz to 2.4GHz with turbo function, 4GB DDR3 SDRAM to run different apps and browsers efficiently at this low-end level, 128GB eMMC (embedded MultiMediaCard) which is slower than SSD and a bit less durable but faster than a SATA mechanical drive and Windows 10 operating system Signature edition pre-installed. You will not be able to upgrade the eMMC flash drive or the memory as they are built into the system. Pentium N3700 is a lower mid range CPU with a benchmark score of 1886 and will handle the daily tasks just fine but is certainly better than the Intel Atom or Celeron’s that you may be familiar with. 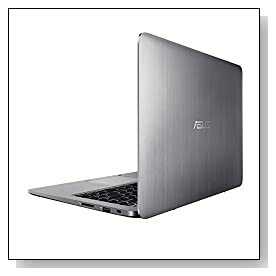 Metallic gray color, solid plastic chassis Asus Vivobook weighs 3.3 pounds and measures 9.3 x 13.3 x 0.7 inches- is only 0.7 inch thick and has a premium feel despite the plastic. It has a great keyboard that is nice to type on with very responsive keys with good key travel, no numpad on the side but a smooth touchpad. It doesn’t have a DVD Drive due to compact and slim chassis or Ethernet / RJ-45 connector for wired internet (use a USB to RJ-45 adapter if you want wired internet) but the most advanced 802.11ac WiFi, Bluetooth 4.0, a total of three USB ports, including a USB 3.0, a USB 3.1 Type-C and a USB 2.0, an HDMI output to connect to a monitor or HDTV and an SD card slot. 14-inch non-touch FHD glossy display has the 1920x1080 pixel resolution offers sharp and clear images, there is a VGA webcam which is just adequate quality at this level for basic live Skype chats and has decent speakers for your music and videos. There is not dedicated graphics card but an Intel HD integrated graphics as this is not designed as a gaming machine but will play the older and not demanding titles like World of Warcraft and Minecraft fluently. It has a non-detachable built-in 57Whrs lithium ion battery for up to 7 to 8 hours of battery life so you can be out almost all day long without worrying about the battery. This is a daily things computer for entertainment, basic office and school tasks, things like video streaming, browsing the internet on multiple tabs, Microsoft Office- Word, Excel and Powerpoint, listening to music etc. and you will have no problems but for anything to do with advanced gaming or multimedia editing, this is not the computer for you. 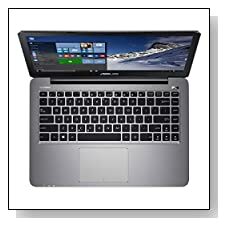 It comes with a year of domestic warranty by Asus and if you’re on the market for a cheap and portable laptop for simple everday tasks, then this one is a great buy that we highly recommend and only has minor flaws for the low price tag.